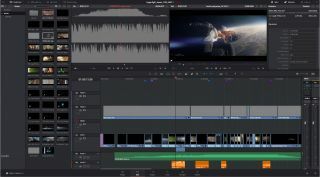 Blackmagic Design has launched DaVinci Resolve 15, the latest incarnation of its industry-standard grading and editing software. Aimed at editors, colorists, VFX artists and sound designers, the update has been released as a free public beta. The biggest news is the inclusion of motion graphics and compositing software Fusion. Fusion is a node-based software with tools for working with footage, generating particles and effects, and a suite of painting tools, as well as a set of keyframe tools alongside a curve editor. The move to bring it into Resolve is a huge deal, enabling artists to stay in a simple interface with the same UI styling, without having to roundtrip to add titles and effects. For compositors and mograph artists, there is now the ability to edit and grade footage using the software, as well as audio tools to take advantage of. The new Fusion tab in DaVinci Resolve 15 brings with it over 250 tools from Fusion 9. While there are too many new features to cover here (we will look at these in more detail in the near future in 3D World magazine), it's worth pointing out that this update will please many users of both applications. Managing files and projects has become instantly easier, system overheads are lower, and for indie film makers or animators, workflow is more streamlined – meaning there’s more time to focus on creating, instead of admin. For Fusion users, there’s nothing to be concerned about. The tools still live together in the Fusion tab and work in the same way, with the same node graph, settings panel and shortcuts that you know and love. It’s just that now they sit alongside a suite of other, powerful tools. You can download DaVinci Resolve 15 for free. There's also a studio version of the public beta available for $299/£229, which adds collaborative tools and spatial noise reduction. Shipping with DaVinci Resolve 15 is the Blackmagic Pocket Cinema Camera 4k – one of a number of new hardware items also announced by the company. The new camera takes the original model and updates it beyond recognition. Paired with Resolve Studio, it could be the core of an indie VFX studio, letting you shoot, edit, grade, and add effects and titles, all for one price with the pro level of interoperability you would expect from a single developer. The camera, which won't be available until September, will land with a 4k Micro Four Thirds chip. Housed in a compact body, it'll include a mini XLR jack with phantom power for pro audio capture. The Pocket Cinema Camera 4k also promises an excellent ISO range of up to 25,600 for low-light shooting and frame rates up to120fps, 13 stops of dynamic range and RAW options. The body will ship with an MFT mount, but adapters will be available for other systems. Should you wish to use the glass from your favourite Canon or similar, you'll be able to. On top of this, the camera has a USB-C port so you can record directly to your editing drive, or use the SD and CFast 2.0 slots built in. There's a five-inch touch display too, which, although fixed, should be good for many situations and grants access to the familiar menu system from the Ursa. The body also has Bluetooth wireless control, HDMI for connecting field monitors and, best of all, will ship with Resolve 15 at a cost of just $1,295. Look out for more on DaVinci Resolve 15 – plus a review of the Pocket Cinema Camera 4k when it ships – in up-coming issues of 3D World. For more information, or to download DaVinci Resolve 15, visit the Blackmagic Design website.